"The awful thing is that beauty is mysterious as well as terrible. God and the devil are fighting there and the battlefield is the heart of man" -Dostoevsky. This is my newest sketch and i have completed sketching it today. Till date, I have sketched quite a lot of sketches, but obviously, i can't recall them all, sometimes I can't even recall what it felt. But there are some, that are still afresh, fresh like the memory of first rain. This one surely is one of them. I am not talking about the details and the perfection of the sketch, I liked it because what it makes me feel, the feeling i will remember it with. Some may see it as a sketch about her helplessness, but for me, its only about her beauty- her sinful beauty. Its about the way light diffused from her skin, illuminating it; how she conceals herself in the shadows, yet revealing her ethereal beauty. She seems to be in conflict with herself, she hides her face behind her hair yet her gaze is fixed and clear. Normally i select a reference photo which I really want to sketch, but in course of sketching, it turns so mundane and i quit it. But sketching this was different, from the beginning i really felt like sketching it and i sketched it continuously (which I rarely do) for around 8-9 hours. At last I was left exhausted, but happy and satisfied. It was worth the time. 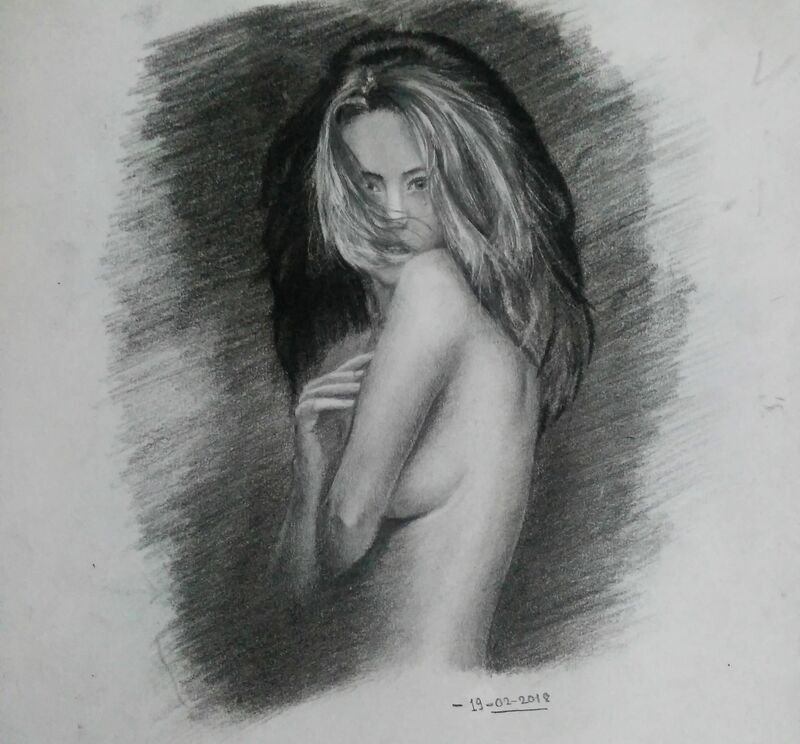 I used charcoal pencil for dark shadings and 2B, 4B graphite pencils for lighter shadings. I used Derwent charcoal pencil, which was my first time. In the beginning, I really struggled with the shading, but later on, it felt good. Cheers if you made it this far!!! Pardon me for my English, it isn't my first language. If you like it and want to help me on my journey in steemit, please consider upvoting it, and express your views about it, please also consider a re-steem so I can reach your audience. You can also follow me @sahchandan for more similar posts to come. K bhanney kya aba. Sidai top ma janey bichar cha jasto cha.!! You got a 2.48% upvote from @ipromote courtesy of @sahchandan! You got a 0.90% upvote from @postpromoter courtesy of @sahchandan!